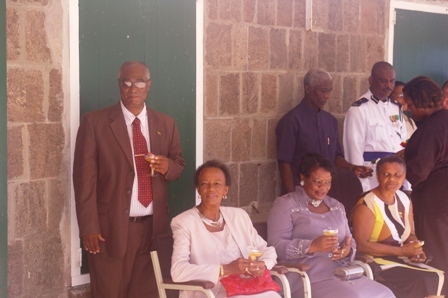 (CHARLESTOWN, NEVIS–TUESDAY, SEPTEMBER 21, 2010) “There are good things happening in Nevis,” these were the profound words of the Premier of Nevis, Hon. Joseph Parry during the 27th Independence celebrations at the Elquemedo Willett Park on Monday morning. This year’s Independence celebrations were held under the theme “Strengthening families for positive Nation building”. The Premier congratulated the awardees at the start of his address including Mrs. Lorna Howell, Mrs. Sheila Daniel and the late Mr. Ronald Pemberton, who passed away early Monday morning. He also commended the young University student, Miss Kurlyn Merchant for her outstanding performance at the Norman Manley Law School in Jamaica. Miss Merchant, he said, had received straight A’s and she was first in her final year class during her time at the University. “Once again we are reminded that it does not matter which island one comes from but it is the vision that you have, along with the creativity and ambition, to broaden ones horizon. The lesson is that we must feel big, feel tall and we must feel equal to any man in the world,” he said. 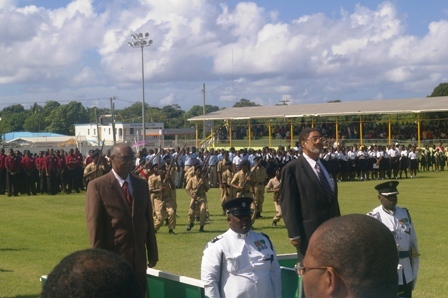 The Premier noted the importance for residents of Nevis to be reminded that they had come from the old days of colonialism to an independent country, with many opportunities available to them today. “Today, let us celebrate what is wholesome in our community. Let us try not to copy the things practiced in the developing world but let us hold fast to what we have in these Caribbean islands and our culture,” he said. Referring to this year’s theme, the Premier said it was important to embrace the Afro centric practice of the extended family and spirituality. The Hon. Joseph Parry also stated that there was a strong need to worship God and embrace the community in order to stamp out crime and give direction to the young people, to have pride in themselves and their island. During the address, the Premier thanked God for shielding Nevis from major storms that had spared the island thus far in the 2010 Atlantic Hurricane Season. He was of the view that God had spared the island of Nevis since it was a praying nation. He asked residents to continue to pray because Nevis needed to realise the opening of Four Seasons Resort as planned in December. The Hon. 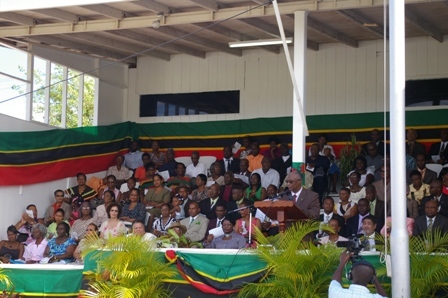 Joseph Parry said despite the many challenges, Nevis should be proud of its achievements. 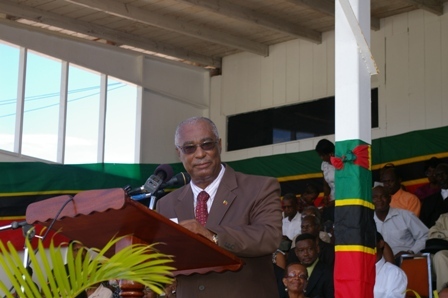 He noted the achievements in Education at the Charlestown and Gingerland Secondary Schools, the Sixth Form College and all the primary schools on the island. “There is a new wind blowing in the country, a wind of ambition, pride, creativity and achievement,” said the Premier. He added that the wind was felt by teachers, students and parents who ensured that their children performed. “I am proud to stand here before you representing the government and people of Nevis and to be associated with over 150 students who are abroad studying in a variety of institutions of higher education. We have young people studying medicine in Cuba through our reasoning and negotiations with St. Kitts and the Cuban government,” he said. 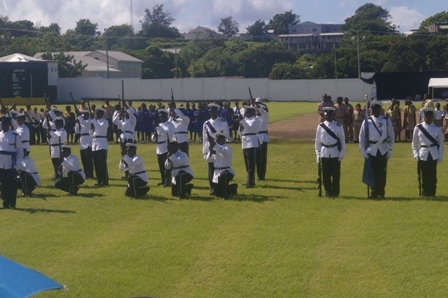 The Premier said that through higher Education, Nevisian students would return home to be in charge of every institution on Nevis and that was what true independence was all about. Hon. Joseph Parry pointed to the island’s success in health, housing, education, roads, agriculture, water development, renewable energy which included wind energy and geothermal. “Nothing can stop the progress of geothermal because it is for all the people of Nevis,” commented the Premier. He pointed to job creation and said that the island of Nevis could boast of the number of jobs created despite the recession. “ The AMMAN Hotel and the efforts of Government to have devolution of power, the introduction of a cosmetic surgery hospital, the investment of the Charlestown Waterfront and all the efforts of the Nevis Reformation Party (NRP)-led government to change the face of Nevis. “We have sought to diversify the economy of Nevis and we have been doing it and I can tell you, that in the next five years, you will give the NRP the chance to complete the job that we have started. We could not have a half done job and we must complete the job. We are depending on you the people of Nevis to appreciate the performance of the NRP and let us finish the job in this county,” concluded the Premier.